Yin Yang is the symbol for balance and a whole lot more. The yin yang mandala is used for meditation, encouraging balance in the meditative state, although it doesn’t quite fit into the design of a religious mandala. It has many other uses as well, partly due to how open the symbol is to artistic expression. Yin yang symbolizes male-female, light-dark, sky-earth, dragon-tiger and up-down. It represents the balance of life. Evil thrives when yin and yang are out of balance. Good prevails as long as yin and yang are balanced. A room or home will “feel” unbalanced when the yin yang, or water and fire Feng Shui energies, are out of balance. 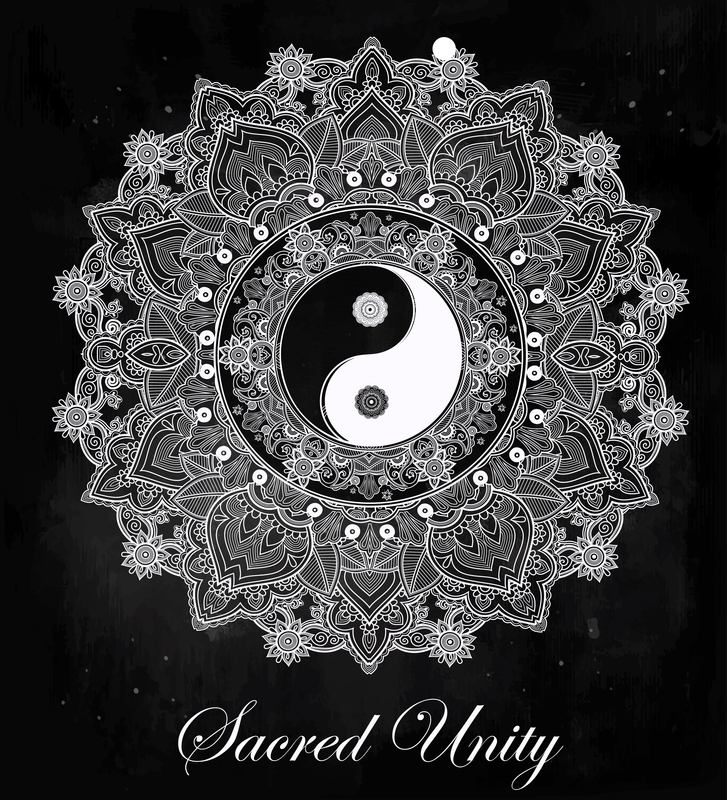 The yin yang symbol lends itself well to the circular mandala and yantra. However, it doesn’t really work as a religious mandala or yantra in the traditional sense. In religions like Hinduism and Buddhism, the mandala and yantra are designed to encompass deities, kings or Buddhas within four gates. The deities, kings or Buddhas included in the design are chosen based on one’s meditative goals. In the sense that a mandala or yantra is intended to be used as a tool for meditation, the yin yang symbol works quite well. It is more in keeping with the Hindu yantra, though, because the yantra is generally only a few colors. Mandalas are usually much more colorful. Colors used in the yin yang design can be chosen to help clear and balance your chakras while meditating. For example, a blue and pink, turquoise or green yin yang mandala can help you focus on balancing the throat and heart chakras. A yin yang design with two fish could be helpful if your purpose for meditating involves abundance or fertility. The yin yang symbol is used in mandala art, jewelry and on just about anything else you might think to put it on. Its design is aesthetically pleasing and it serves as an acknowledgement of the need for balance in one’s life. A yin yang necklace made with natural gemstones can be used in meditation to clear and align chakras and worn as a beautiful piece of jewelry. A yin yang pendant made from olive jade and pink tourmaline, for example, is excellent for the heart chakra. Yin Yang banners are a great way to decorate and express yourself. The yin yang images can incorporate other elements in addition to the yin yang symbol to really personalize what it represents or to suit your taste. A yin yang banner with two paw prints where the dots would normally be can be used to signify your love of animals. An elemental yin yang banner imparts deeper meaning with water and fire used to represent the dark and light. Mandala coloring is fun but it is also therapeutic. 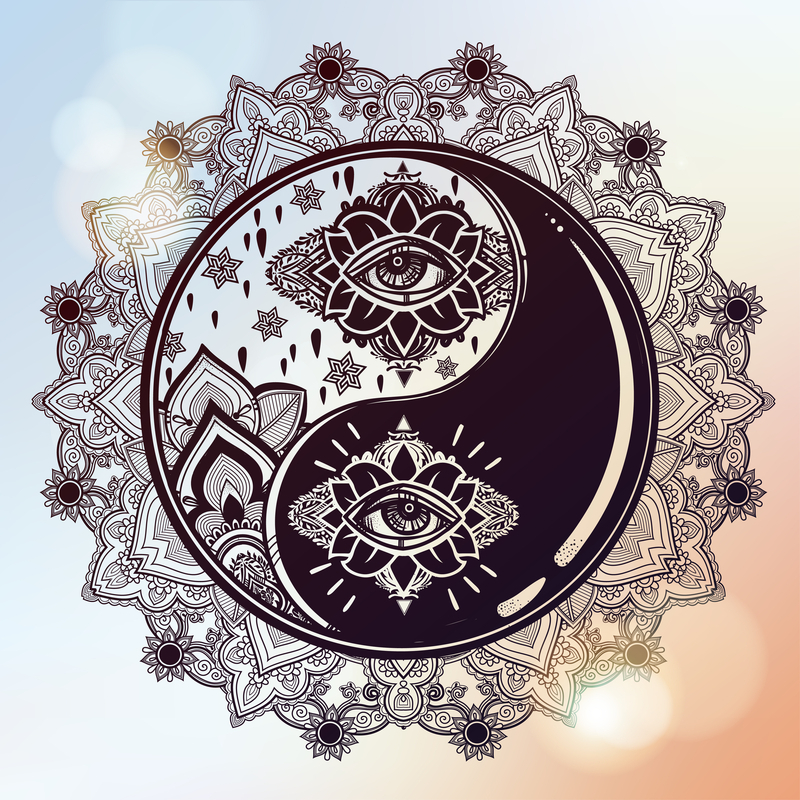 The yin yang patterns in mandala art can consist of the yin yang design with a colorful border and/or various shapes within the yin yang mandala design. Mandala coloring pages can be downloaded on-line. Some you have to pay a small amount for but they are also available for free. You may have a hard time finding a yin yang mandala coloring sheet, since it doesn’t technically qualify as a mandala design in accordance with any religions. However, the yin yang symbol is such a simple design you may not need coloring pages. Just sit down with a piece of paper and some colored pencils and let your imagination be your guide. Any colors are fine, add various shapes or flowers to the design or make the two halves animal shapes. You can use two different colored fish, horse heads or any animal images that lend themselves to half-circle patterns. The yin yang pattern is often combined with the lotus in yin yang mandala tattoos. The yin yang male female symbol is at the center surrounded by lotus petals. This is the ultimate representation of balance. Both yin yang and lotus represent water and fire energies. You can, of course, get just the yin yang symbol or a yin yang symbol with a more traditional mandala design that includes a representation of the four gates. The best placement for yin yang mandala tattoos is the back. With their circular shape, a flat surface works best. You can have them put elsewhere but the edges will typically wrap around the sides of a leg or arm. Smaller yin yang designs work well anywhere.